HomeHolistic Health7 Can Opener Relationships That Shocked Me Awake – Are You In One?! Ever had a partnership, job or encounter with someone, who shocked you awake? 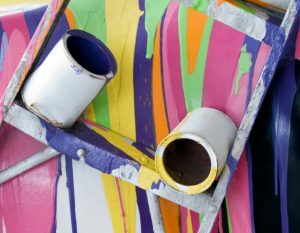 Here’s a post on can opener relationships – a term I use for ‘the one you meet before the one’, in the kindest possible way! It’s like when you ask someone to loosen the lid of a paint can, until you can open it yourself (and find your true colours). Well, the same thing can happen with your heart…someone will come to get you ready (often using reverse psychology) just before you reach a milestone – kind of like an Angel undercover. They help you to set limits, and get healthy again, by highlighting where you are too closed or scattered energetically. Some people call them energy vampires. I think of them as Souls who haven’t quite grown up yet, and need a lesson in re-parenting. 7 Can Opener Relationships – Are You In One?! 1) The job where they reduced my pay…while asking me to do more. Years ago, I was working in the not-for-profit sector when we lost our sponsorship. As a result, I was asked to take a pay cut, which I agreed to reluctantly. In the end, I left that job a few months later and the organisation went through a series of redundancies – you could say I was the first rat off the sinking ship, so to speak. As much as I loved many perks of that role and the other staff, it was a challenging one as we were always scraping by – not a recipe for high creativity or innovation! Looking back, I realised I was in a 9 Personal Year of Conclusions and Rewriting History at the time, so it makes sense that I had to surrender to a greater order. The upside: I was so deflated after that, I changed careers into fundraising where I made much greater waves. Find your personal year. 2) The ‘boyfriend’ who refused to call me his girlfriend. I’m sure you’ve had one of these too. In my case, this was a relationship I had before meeting my husband and 11:11 Soulmate, Kris Anderson. So often, we are tested just before we meet our lifetime love – it’s like a video game or movie in that respect. Interestingly, this person was the same lifepath as me (a 29/11 Spiritual Messenger), so we had lots in common – unfortunately that included all the same hangups and insecurities as well, which was not my cup of tea. That’s not to say that 11 lifepaths are not compatible, just that it didn’t work for me in this instance. Many of my best friends and therapists are 29/11’s. Remember, your lifepath is only 25% or so of your numerology forecast – your name, pinnacles, personal years and free will are also highly influential. The upside: Although this relationship was dysfunctional, it did introduce me to some great healers and personal growth movements. It also made me realise I needed to go celibate and write a relationship wishlist in order to find my true Soulmate. More on Soulmate myths and relationship lines in palmistry. 3) The boss who bullied me into a hospital bed. Part of the journey as an empath is to find your boundaries, usually by dealing with psychopaths and narcissists at some stage (truthfully, we are all on the spectrum – I’m not claiming to be a Saint either!). A long time ago, I secured my dream job, only to realise that my employer was a bully, who would pick on me, mainly when no one was looking. I wasn’t supposed to laugh, whistle, have visitors, leave on time…it was a classic abusive relationship only in a workplace. I ended up being admitted to hospital and leaving that position for medical reasons. My gut still hasn’t quite recovered. The upside: This experience cured me of the delusion that being important is the same as making a difference. I ended up moving countries and starting over again without the need for the big job title anymore. 4) The website company who held my blog hostage. I’ve previously written about Vistaprint and their awful website builder. Pay peanuts, get monkeys as they say. I can’t believe it took me years to take back my domain name and copy over my hundreds of blogs. It was just easier to stay put (and keep paying exorbitant fees despite the outdated templates). Never again will I cede control to a company who makes a living by discounting everyone else out of business. That’s a recipe for poverty consciousness and unhealthy monopolies – the opposite of what I stand for, which is 11:11 grassroots empowerment and creative diversity. The upside: I learned that change is easy when you have the right people there to catch you…I’m a lot more willing now to pay for qualified help. More on creating a safety net for high flyers. 5) The spiritual teacher, who told me I was ‘doing it wrong’. I’ve already posted about New Age lightwashers, so no need to repeat too much here. Suffice to say, if you meet someone who talks about gurus and famous people a lot, fixates on tiny details rather than people’s experiences, and/ or plagiarises information, please run a mile and go talk to a tree or your Guardian Angels instead. The upside: I’m careful to stay in integrity and walk my talk, especially when teaching palmistry and numerology. After this experience, I stopped going to weekend retreats which promised the world, and started enrolling in programs which spanned months or years. It was like moving away from ‘one hit wonder’ to ‘marriage energy’ and has been far less stressful. 6) The psychic, who said my Mum was cursed and could be cured if I gave her thousands of dollars. I’ve mentioned her in my crazy psychics post. Basically, I saved myself from being scammed because I knew some palmistry and that she was faking things. The upside: I kept investing in my spiritual education and also developed a burning desire to transform the public’s perception of psychics, and their own intuition, from scepticism to trust (my business mission statement). Plus, I learned to be wary of psychics who couldn’t back up their claims or explain their methodology. 7) The family friend, who said I was possessed by a demon because I’m a numerologist. Weirdly, he was a member of a church, where people spoke in tongues (to me, that’s more wacky that crunching figures and looking for patterns.) Also he decided to tell me all this over Christmas lunch, which was bizarre when you consider that Jesus Christ was all about love and acceptance. The upside: I had an a-ha moment as he talked to me, which I’ll never forget. Not only were we sitting as table 33 (the vibration of words like Teacher, Priest, Wake Up Call and Scapegoat), a beam of light hit our table and I got a phone call as he lectured me. That call was from a radio station, who wanted to interview me immediately. I had visited the site of the Lindt Cafe massacre the night before and prayed to God, ‘please put me on air again so I can share the love’, so I wasn’t surprised when my wish came true. -You constantly question if your partner is ‘the one’. When I was with the guy in point 2), I was always pulling Tarot cards or having readings etc. to convince myself we were destined to be together. That’s a warning signal. You can change the outcome of a psychic reading if you want something enough! Love arises like the fragrance from a flower, it shouldn’t need to be yanked home like a naughty puppy. -You hide what is going on – see my post on my ex, who threatened others with a knife – at the time I thought disarming him was normal, rather than worrying. -You find yourself comparing yourself to others, to the point that people comment on it. Again, this suggests you intuitively know something is unbalanced but you don’t want to admit it. -You are more focused on how the relationship looks that where it’s going. This is embarrassing, but I always knew I was in a crappy relationship when I found myself wanting them to change their Facebook status or hold my hand in public, just so I could fell more accepted. -Firstly, don’t rush! Failing to plan, is planning to fail. Write a list of pros and cons of the relationship or job etc. If you can’t think of many pros, even after taking a few days to reflect, it’s time to get moving…keep this list for reference in case you need reminding of why you need to leave! -Consider mind-mapping your options – asking an objective friend or therapist to help you is recommended. When you are in jail, it’s hard to picture the stars. -This meditation may help. You can record it on your phone if that helps. Visualise yourself looking into a mirror. Imagine there is a dial you can turn up or down. Turn it 10 years ahead and ask Spirit to show you where you are heading if nothing changes in this situation. Are you more happy or less happy? Do you have more choices, or less choices? Do you feel more loving or less loving? If you’re having trouble seeing anything, listen – maybe your guidance comes through words or knowing instead. Also turn the dial 10 years back and ask that version of you if they have any advice for you now. Then go back to your current age. Picture yourself glowing with a golden light. Place an Angel behind you and let them support you as you open your wings right up to the sky and give them a good flap. Say out loud, ‘Dear Spirit, I am open to love again today – please, remove any people, places or things, which are no longer helping me to grow. In their place, please send me support, opportunities and new relationships which will take me higher. I am a clear channel for love and I call in my good now and for the rest of my days. Only life-giving choices occupy my consciousness. I wish for this or something better for my highest good. Thank you and Amen (or Namaste)’. You might yawn or get goosebumps during this exercise – all positive signs of a good connection. Yawning clears our Throat chakra and resets our inner voice. 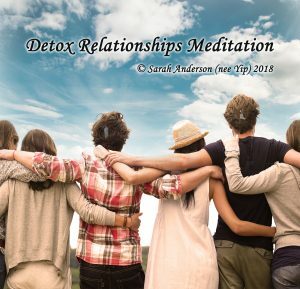 If you need something stronger, buy my Detox Relationships MP3, it’s incredibly effective and tested by many clients. -Researching people who have recovered from similar situations can be empowering – you might even know some people in your close circle who can assist. -I also recommend seeking help from Lifeline, Beyondblue etc if you are in a crisis situation. Better to be safe than sorry. The good news is, that can openers come before the juicy content(ment). While it might seem like they have opened a can of worms or Pandora’s box, remember that that the truth is often hidden behind illusions and fear. These types of wake ups are often a sign we are approaching a spiritual finish line and finding our purpose. It’s like a target in archery – celebrate how close you are getting to the bullseye, because progress is more important than perfection. Or, for greater clarity, book a reading with me to discover your soul contract and annual forecast. it’s worth the suspense – see feedback. I also teach numerology and palmistry workshops in Brisbane. For a reading within 7-14 days, book a Tarot reading in Brisbane with my husband Kris on 0428 626 727. Read more about Kris. I also recommend Vicki Haspels and Caroline Byrd, my spiritual mentors and gifted mediums.